I hope that book clubs and classes discussing my books will find the below questions and exercises both helpful and inspirational. Thank you so much to all the readers who helped me compile these! You can also listen to Chapter One of the audiobook on YouTube. The screw through cinder’s ankle had rusted, the engraved cross marks worn to a mangled circle. Her knuckles ached from forcing the screwdriver into the joint as she struggled to loosen the screw one gritting twist after another. By the time it was extracted far enough for her to wrench free with her prosthetic steel hand, the hairline threads had been stripped clean. 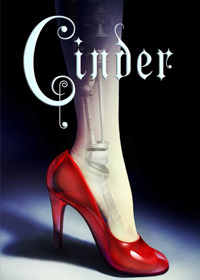 Tossing the screwdriver onto the table, Cinder gripped her heel and yanked the foot from its socket. A spark singed her fingertips and she jerked away, leaving the foot to dangle from a tangle of red and yellow wires. She slumped back with a relieved groan. A sense of release hovered at the end of those wires— freedom. Having loathed the too- small foot for four years, she swore to never put the piece of junk back on again. She just hoped Iko would be back soon with its replacement. Cinder was the only full- service mechanic at New Beijing’s weekly market. Without a sign, her booth hinted at her trade only by the shelves of stock android parts that crowded the walls. It was squeezed into a shady cove between a used netscreen dealer and a silk merchant, both of whom frequently complained about the tangy smell of metal and grease that came from Cinder’s booth, even though it was usually disguised by the aroma of honey buns from the bakery across the square. Cinder knew they really just didn’t like being next to her. A stained tablecloth divided Cinder from browsers as they shuffled past. The square was filled with shoppers and hawkers, children and noise. The bellows of men as they bargained with robotic shop keepers, trying to talk the computers down from their desired profit t margins. The hum of ID scanners and monotone voice receipts as money changed accounts. The netscreens that covered every building and filled the air with the chatter of advertisements, news reports, gossip. Cinder’s auditory interface dulled the noise into a static thrumming, but today one melody lingered above the rest that she couldn’t drown out. A ring of children were standing just outside her booth, trilling—”Ashes, ashes, we all fall down!”— and then laughing hysterically as they collapsed to the pavement. A smile tugged at Cinder’s lips. Not so much at the nursery rhyme, a phantom song about pestilence and death that had regained popularity in the past de cade. The song itself made her squeamish. But she did love the glares from passersby as the giggling children fell over in their paths. The inconvenience of having to swarm around the writhing bodies stirred grumbles from the shoppers, and Cinder adored the children for it. Sacha met Cinder’s gaze, knotted her lips, then grabbed her son by the arm and spun away. The boy whined, dragging his feet as Sacha ordered him to stay closer to their booth. Cinder wrinkled her nose at the baker’s retreating back. The remaining children fled into the crowd, taking their bright laughter with them. “It’s not like wires are contagious,” Cinder muttered to her empty booth. With a spine- popping stretch, she pulled her dirty fingers through her hair, combing it up into a messy tail, then grabbed her blackened work gloves. She covered her steel hand first, and though her right palm began to sweat immediately inside the thick material, she felt more comfortable with the gloves on, hiding the plating of her left hand. She stretched her fingers wide, working out the cramp that had formed at the fleshy base of her thumb from clenching the screwdriver, and squinted again into the city square. She spotted plenty of stocky white androids in the din, but none of them Iko. Sighing, Cinder bent over the toolbox beneath the worktable. After digging through the jumbled mess of screwdrivers and wrenches, she emerged with the fuse puller that had been long buried at the bottom. One by one, she disconnected the wires that still linked her foot and ankle, each spurting a tiny spark. She couldn’t feel them through the gloves, but her retina display helpfully informed her with blinking red text that she was losing connection to the limb. With a yank of the last wire, her foot clattered to the concrete. The difference was instant. For once in her life, she felt . . . weightless. She made room for the discarded foot on the table, setting it up like a shrine amid the wrenches and lug nuts, before hunkering over her ankle again and cleaning the grime from the socket with an old rag. Cinder jerked, her head smacking the underside of the table. She shoved back from the desk, her scowl landing first on a lifeless android that sat squat on her worktable and then on the man behind it. She was met with startled copper- brown eyes and black hair that hung past his ears and lips that every girl in the country had admired a thousand times. Cinder barely heard him above the blankness in her mind. With her heartbeat gathering speed, her retina display scanned his features, so familiar from years spent watching him on the netscreens. He seemed taller in real life and a gray hooded sweatshirt was like none of the fine clothes he usually made appearances in, but still, it took only 2.6 seconds for Cinder’s scanner to mea sure the points of his face and link his image to the net database. Another second and the display informed her of what she already knew; details scribbled across the bottom of her vision in a stream of green text. BORN 7 APR 108 T.E. Cinder launched up from her chair, nearly toppling over when she forgot about her missing limb. Steadying herself with both hands on the table, she managed an awkward bow. The retina display sank out of sight. “Your Highness,” she stammered, head lowered, glad that he couldn’t see her empty ankle behind the tablecloth. Wide- eyed, Cinder forced a shaky nod. “Right. Of course. How— can I— are you—” She swallowed, the words sticking like bean paste to her tongue. Her eyes followed his hand as he planted it on top of the android’s bulbous head. “Yes, Your High—” She bit down on her lip. Instead of answering, the prince bent down, craning his neck so that she had no choice but to meet his eyes, and dashed a grin at her. Her heart winced. The prince straightened, forcing her gaze to follow him. The android looked like it had just stepped off the conveyer belt, but Cinder could tell from the mock- feminine shape that it was an outdated model. The design was sleek, though, with a spherical head atop a pear- shaped body and a glossy white finish. Leaning forward, Prince Kai picked up Cinder’s small metal foot from the worktable, turning it curiously over in his palms. Cinder tensed, watching as he peered into the wire- filled cavity, fiddled with the flexible joints of the toes. He used the too- long sleeve of his sweatshirt to polish off a smudge. “Aren’t you hot?” Cinder said, instantly regretting the question when his attention returned to her. Cinder considered telling him it wasn’t working but thought better of it. The lack of a throng of screaming girls surrounding her booth was probably evidence that it was working better than she suspected. Instead of looking like a royal heartthrob, he just looked crazy. He wasn’t the first to voice surprise. Most of her customers couldn’t fathom how a teenage girl could be the best mechanic in the city, and she never broadcast the reason for her talent. The fewer people who knew she was cyborg, the better. She was sure she’d go mad if all the market shop keepers looked at her with the same disdain as Chang Sacha did. Fingers stalling, Cinder glanced up at him. An orange light flickered in the corner of Cinder’s vision. Her optobionics had picked up on something, though she didn’t know what— an extra swallow, a too- quick blink, a clenching of the prince’s jaw. She was used to the little orange light. It came up all the time. It meant that someone was lying. The prince listed his head, as if challenging her to contradict him. A strand of black hair fell into his eyes. Cinder looked away. Raising her fist, she thunked the android hard on the side of its head, barely catching it before it toppled over onto the table. The prince jumped. Cinder’s stomach twisted in embarrassment, even as the prince laughed. Iko obeyed, pushing aside the tablecloth and ducking under the table. “I do not have a programming error!” said Iko from behind her. Cinder met the prince’s gaze, was caught momentarily dazzled by another easy laugh, and ducked her head back behind his android. “I’ll need to run her diagnostics. It will take me a few days, maybe a week.” Tucking a strand of hair behind one ear, Cinder sat down, grateful to give her leg a rest while she examined the android’s innards. She knew she must be breaking some rule of etiquette, but the prince didn’t seem to mind as he tipped forward, watching her hands. “It’ll be my plea sure.” He dipped his head in polite farewell, simultaneously pulling the edges of the hood farther over his face. Cinder returned the nod, knowing she should have stood and bowed, but not daring to test her balance a second time. She waited until his shadow had disappeared from the tabletop before surveying the square. The prince’s presence among the harried crowd seemed to have gone unnoticed. Cinder let her muscles relax. Cinder bent over and picked up her replacement foot, dusting it off on her cargo pants. She checked the plating, glad that she hadn’t dented it. “Can you imagine Peony’s expression when she hears about this?” said Iko. Cinder dropped her hand. “What does it matter? Come on, help me put this on before any other royalty stops by.” She propped her ankle on the opposite knee and began connecting the color- coordinated wires, wondering if the prince had been fooled. “Fits like a glove, doesn’t it?” Iko said, holding a handful of screws while Cinder twisted them into the predrilled holes. “It’s very nice, Iko, thank you. I just hope Adri doesn’t notice. She’d murder me if she knew I’d spent 600 univs on a foot.” She tightened the last screw and stretched out her leg, rolling her ankle forward, back, wiggling the toes. It was a little stiff, and the nerve sensors would need a few days to harmonize with the updated wiring, but at least she wouldn’t have to limp around off kilter anymore. A scream filled Cinder’s ears. She flinched, the sound peaking in her audio interface, and turned toward it. The market silenced. The children, who had switched to a game of hide-and-seek among the clustered booths, crept out from their hiding spots. The scream had come from the baker, Chang Sacha. Baffled, Cinder stood and climbed on top of her chair to peer over the crowd. She spotted Sacha in her booth, behind the glass case of sweet breads and pork buns, gawking at her outstretched hands. Cinder clamped a hand over her nose at the same moment realization skittered through the rest of the square. The street filled with panic. Mothers scooped up their children, masking their faces with desperate hands as they scrambled to get away from Sacha’s booth. Shop keepers slammed shut their rolling doors. Sunto screamed and rushed toward his mother, but she held her hands out to him. No, no, stay back. A neighboring shopkeeper grabbed the boy, tucking the child under his arm as he ran. Sacha yelled something after him, but the words were lost in the uproar. Cinder’s stomach churned. They couldn’t run or Iko would be trampled in the chaos. Holding her breath, she reached for the cord at the booth’s corner and yanked the metal door down its rail. Darkness cloaked them but for a single shard of daylight along the ground. The heat rose up from the concrete floor, stifling in the cramped space. “Cinder?” said Iko, worry in her robotic voice. She brightened her sensor, washing the booth in blue light. “Don’t worry,” Cinder said, hopping down from the chair and grabbing the grease- covered rag from the table. The screams were already fading, transforming the booth into its own empty universe. “She’s all the way across the square. We’re fine here.” But she slipped back toward the wall of shelves anyway, crouched down and covered her nose and mouth with the rag. There they waited, Cinder breathing as shallowly as possible, until they heard the sirens of the emergency hover come and take Sacha away.